Most of us would have read / watched “The Jungle Book” by Rudyard Kipling at some point of our lives, then why did I pick this book again? No, no my little one is too young for story book reading as of now, its my own love for graphic novels and comic books which makes me pick up these even if the story is read earlier in text books or elsewhere. 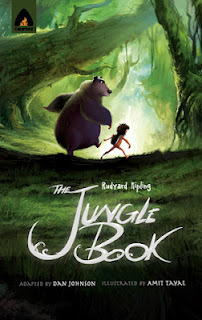 So, when Campfire sent a mail for reviewing their new titles, I immediately picked up few for review and one of those was “The Jungle Book” by Rudyard Kipling. Having read their books earlier, I was sure that their presentation would definitely have something new to offer. And man, wasn’t I right! It’s yet another beautiful visual treat by the Campfire team. Loved it, absolutely loved it! As I mentioned earlier, it’s a visual treat! Have to say this about the graphic team of Campfire – your presentation is class apart, really love the way stories get illustrated at your end. Language is simple and can be easily understood by kids of reading age group. Length of the book is also apt, neither too long for kids to lose interest nor too short for grown ups to miss their attention. 101 pages of total fun! Like most Campfire books, even this one comes with some interesting trivia about “Rudyard Kipling”, “The Jungle Book” story and movie at the end. 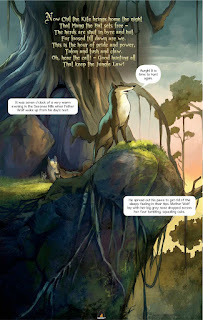 There is a cute poster of Mowgli and his fun at the end of the book . From my side, it’s a thumbs-up for this book. I’ve read their one more title during my pre-baby era and will be posting a review of it soon. Would love to read more books from Campfire and yes waiting eagerly for the little one to grow and see if he develops the taste for reading or not. Totally up to his interest level but if he does, Campfire books would definitely be on my recommendation list for him.